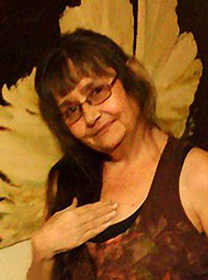 Yvonne Ann Graham, 53, Nevada, Mo., passed away on Saturday, March 16, 2019, at Mercy Hospital in Springfield, Mo., following a lengthy illness. Yvonne was born July 12, 1965, in Nevada, Mo., the daughter of John P. and Janice D. (Rapp) Heim. She was united in marriage to Bryan Blackwell in July of 2018. Yvonne grew up in Nevada and attended Nevada schools. She loved music and dancing, and spending time with her grandchildren. In addition to her husband, Bryan, she is survived by two daughters, Lavonna Graham, Moberly, Mo., and Dannalee Drewery and her husband, John, Norfolk, Va.; two sons, Richard Thrun, Hannibal, Mo., and Daniel Graham, Nevada, Mo. ; 11 grandchildren; one brother, Daniel Heim, Nevada, Mo. ; and one sister, Cathy Heim, Lake Ozark, Mo. She was preceded in death by her parents; one sister, Trisha Heim; and one aunt, Linda Hartline.